At the invitation of the President of the Republic of Slovenia, Danilo Türk, PhD the Norwegian King Harald V and Queen Sonja visited the Republic of Slovenia on 9 and 10 May 2011. The Norwegian royal couple was received by the President of the Republic of Slovenia Danilo Türk, PhD and his wife Barbara Miklič Türk; the couple also met with the President of the National Assembly Pavel Gantar, PhD and the Prime Minister Borut Pahor. In the framework of the visit, the Memorandum on the implementation of the EEA Financial Mechanism and the Memorandum on the implementation of the Norwegian Financial Mechanism were signed. 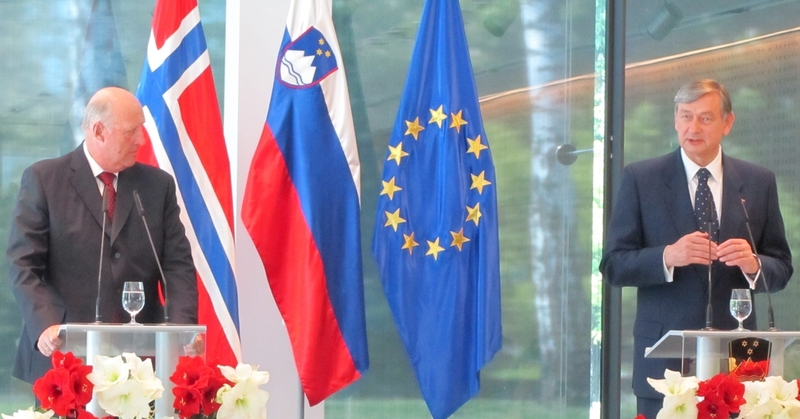 In the framework of the organization of the Norwegian business delegation, which accompanied the king, the Slovenian-Norwegian business forum was held.